This southeastern species reminds me of a faded Suillus pictus or Suillus lakei. The cap is a dull pinkish orange, providing a subtle but attractive contrast with the yellow pore surface. Like its more brightly colored counterparts, Suillus decipiens has a dry cap--a welcome relief in a genus filled with slimeballs. 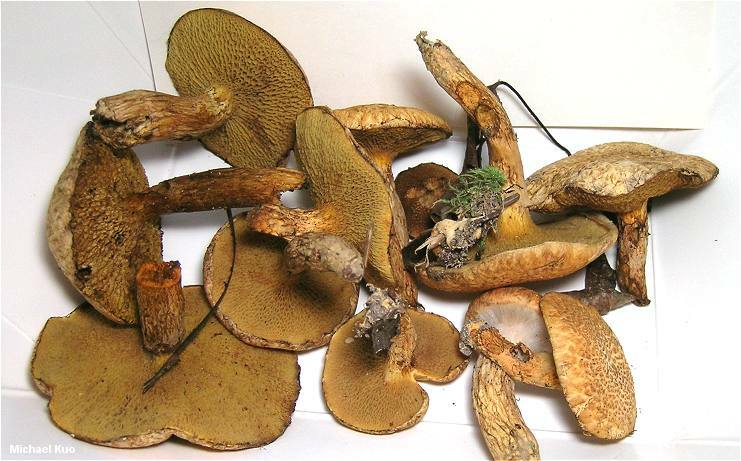 Look for Suillus decipiens under pines (species of Pinus, with bundled needles) from New Jersey to Florida, and west to Texas. Boletinus decipiens is a synonym. Suillus floridanus is a probable synonym. Ecology: Mycorrhizal with pines (species of Pinus); growing scattered or gregariously; summer, fall, and winter; southeastern United States to Texas. Cap: 3.5-7 cm; convex becoming broadly convex or flat; dry; yellowish to dull cinnamon or dull orange under small, brownish yellow fibers and scales; often with whitish to yellowish or grayish partial veil remnants on the margin. Pore Surface: Yellowish, becoming brownish yellow; not bruising, or bruising faintly brownish; pores angular, to 1 mm across, radially arranged; tubes to 6 mm deep; initially covered by a whitish partial veil. Stem: 3-7 cm long; up to 1.5 cm thick; more or less equal; dry; finely hairy; yellowish to orangish or brownish; occasionally with a fragile ring; without glandular dots. Flesh: Whitish to yellowish; not staining on exposure, or staining slowly pinkish. Chemical Reactions: Ammonia rusty brown, then grayish lilac on cap surface; rusty brown, then blackish on flesh. KOH greenish black on cap surface and flesh. Iron salts slowly black on cap surface and flesh. Microscopic Features: Spores 9-12 x 3.5-5 µ; smooth; subfusoid. Pleurocystidia cylindric to fusoid or subclavate; 40-70 µ long; mostly in bundles; brown in KOH. Clamp connections absent.